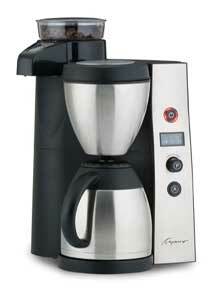 Home»Coffee Grinders»The Capresso Coffee Team Therm Coffee Maker/Grinder Closeout! The Capresso Coffee Team Therm is the only coffee maker/conical burr grinder combination to feature a stainless steel vacuum carafe to keep coffee hot and fresh for hours after brewing. The conical burr grinder grinds slowly to impart minimal heat, preserving coffee aroma. The Capresso Coffee Team Therm features patented technology allowing it to grind coffee directly into the filter basket, then automatically swings into place and begins the brewing process.